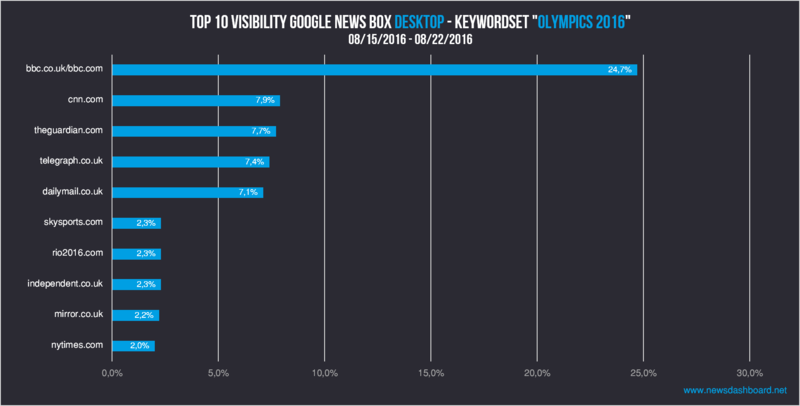 Olympics in Rio 2016 – Which News Publishers win the Google News Boxes Desktop and Mobile in UK? The Olympic Summer Games in Rio de Janeiro ended on Sunday, 21 August 2016 with a huge final ceremony. Many athletes from the United Kingdom were successful and brought medals home, e.g. Mo Farah and Charlotte Dujardin. But which news publisher benefited most from the Olympics? 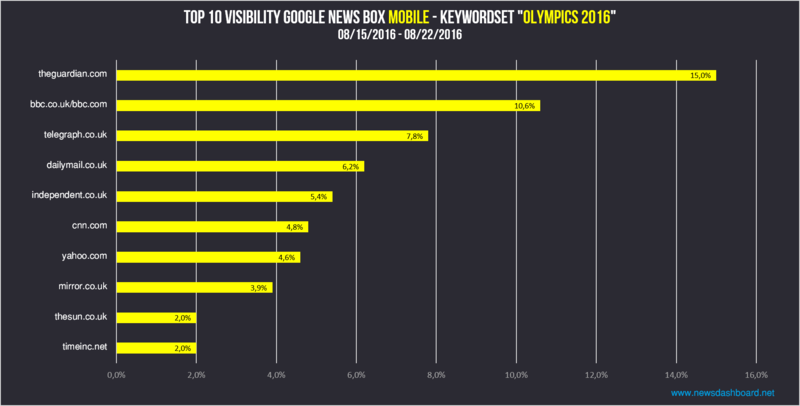 Who had the highest visibility in the Google News Boxes? We analysed both desktop and mobile data. For the latter, we looked at the rankings in the News Carousels as well as at the text and picture links in the mobile Google News Boxes. Our survey period was between 15 August and 22 August 2016 (For information on the first half of the Olympic Games, see our former analyses). The following chart shows that there are three big blocks regarding the visibility. The BBC is undisputedly at the top, and is thus the big winner of the Desktop Google News Boxes. The pages bbc.co.uk and bbc.com gather a visibility of 24.7 percent. This gives the BBC by far the highest share in the Google News Boxes Desktop. After that follow four news publishers which all reach a similar range: cnn.com, theguardian.com, telegraph.co.uk, and dailymail.co.uk have a visibility between 7.1 and 7.9 percent. It is surprising that the American news channel cnn.com was able to secure position 2 in the top 10, even before the English big players The Guardian, The Telegraph, and Daily Mail. The BBC dominates the Google News Boxes Desktop for our Olympic set of keywords. All of the remaining news publishers in the top 10 reach a visibility of around 2 percent. They form the third big block regarding visibility in the Google News Boxes Desktop. Therein we find several surprises. One could have expected skysports.com – a pure sports service – to make it up higher into the top 10. Another surprise is that rio2016.com, the official page of the Olympic Games, shows up in the top 10. One could suspect indeed that the official homepage has a lot of trust and therefore shows up often in the Google News Boxes. When we compare the top 10 results from the UK with those of other countries though, it strikes that rio2016.com shows up rather often in the Google News Boxes Desktop in the United Kingdom only. In Germany and France as well in the USA, the official page of the Olympic Games is not in the top 10. Looking at the results of the Google News Boxes Mobile, we get a completely different picture. Instead of the BBC, theguardian.com is on the first position regarding the visibility in the News Carousels and the picture and text links in the mobile News Boxes. Theguardian.com reaches a visibility of 15 percent in our set of keywords for the Olympic Games in Rio. Bbc.co.uk and bbc.com together reach a visibility of 10.6 percent. This is without doubt a great result, too, but it is still only position 2 for the BBC mobile-wise. Theguardian.com has the highest visibility in the Google News Boxes and News Carousels Mobile. Similar to the desktop results, telegraph.co.uk and dailymail.co.uk are well represented in Google News Mobile. The Telegraph reaches a visibility of 7.8 percent, while Daily Mail reaches 6.2 percent. Independent.co.uk is represented more often mobile-wise than in the Desktop News Boxes. For comparison: The Independent has a visibility of 5.4 percent in the Mobile News Carousels and News Boxes, while it reaches 2.3 percent in the Desktop News Boxes. Further successful news publishers in the Google News Boxes and News Carousel Mobile are cnn.com, yahoo.com, mirror.co.uk, thesun.co.uk, and timeinc.net. In Summary it can be stated, that the BBC and The Guardian are the winners of the Olympic Games, at least regarding the Google News Boxes. Concerning the desktop results, bbc.co.uk/bbc.com is clearly leading; theguardian.com also reached great results with a visibility of 7.7 percent and a good third place in the top 10. If we add the very high visibility in the mobile Google News Boxes and News Carousels, then theguardian.com has clearly done a good job. Adam Peaty, Alistair and Jonny Brownlee, Basketball, Boxing, Brownlee Brothers, Caster Semenya, Charlotte Dujardin, Cycling Olympics, Dina Asher-Smith, Eliud Kipchoge, Giles Scott, Greg Rutherford, Gymnastics, Hockey Rio, IOC, Jack Burnell, Jack Laugher, Jade Jones, Jasmin Carlin, Jason Kenny, Jessica Ennis-Hill, Jon Schofield, Laura Trott, Liam Heath, Lutalo Muhammad, Marathons, Max Whitlock, Medal standings, Michael Conlan, Michael Phelps, Mo Farah, Mohamed Farah, Nicola Adams, Olympia Closing ceremony, Olympic Games, Olympic Games 2016, Olympic Games Rio 2016, Olympics, Olympics 2016, Olympic Athletics, Olympics Gymnastics, Olympics News, Olympics Results, Olympics Rio, Olympics Rio 2016, Olympics swimming, Rio, Rio 2016, Rio de Janeiro, Rio Olympics, Rowing, Russia, Ryan Lochte, Sailing Olympics, Soccer, Summer Olympics, Swimming, Taekwondo Olympics, Team GB, Team UK, Track cycling, Triathlon, Usain Bolt, Vicky Holland, Volleyball, Wayde van Niekerk, Women´s boxing, women´s hockey, women´s hockey finals 2016, women´s hockey rio.